Caption: Looking north from Great Altar Temple of Heaven, Peking. 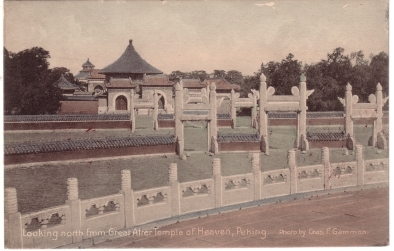 Action: Balustrade of the outer circle of Altar of Heaven (Huanqiu) with boundary walls, north towards Huangqiongyun. The last hall is Qinandian in the Temple of Heaven compound.